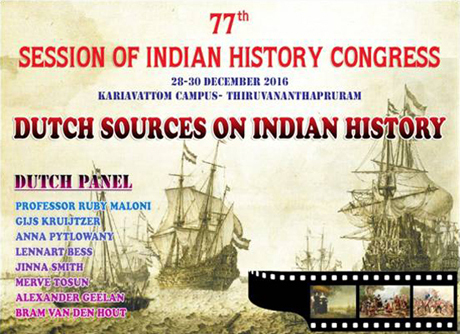 Indian History Congress is the largest professional and academic body of Indian historians, with over 30,000 members. It was established in 1935. The lead to establish an all India National Congress of historians was taken by 'Poona historians' during the colonial rule. The first session took place in 'Bharat Itihas Sanshodhak Mandal', Pune in 1935. Major historians like DattoVaman Potdar, Surendra NathSen (who later became the first director of National Archives of India), Sir Shafaat Ahmad Khan (The founder of the Journal of Indian History), etc., attended the first session. Historians like R S Sharma, Romila Thapar, K N Panikkar, Irfan Habib, Bipan Chandra, Chempakalakshmi, Rajan Gurukkal, et al, have had a long association with the Indian History Congress. It's current General President is Prof. K Paddayya, eminent archaeologist, who is Prof. Emeritus at the Deccan College, University of Pune, the Mecca of Indian Archaeologists, of which he has also been the Director. Prof. Shireen Moosvi (Aligarh Muslim University) will take over from him. Prof. Ishrat Alam (Aligarh Muslim University) is the Secretary. The Jawaharlal Nehru University hosted the 75th session of the Indian History Congress with Dr. Rakesh Batabyal, Deputy Director, Academic Staff College, JNU, New Delhi and Concurrent Faculty, Centre for Media Studies, School of Social Sciences, as the Local Secretary. Prof. B.D. Chattopadhyaya was the General President. The Vice-President of India, Shri. Mohammad Hamid Ansari inaugurated the Session. The Gour Banga University hosted the 76th session of the Indian History Congress, Malda, West Bengal with Dr. Sanatan Das, Controller of Examinations as the Local Secretary. Prof. K Paddayya, eminent archaeologist, was the General President. The Governor of West Bengal inaugurated the 76th Session. 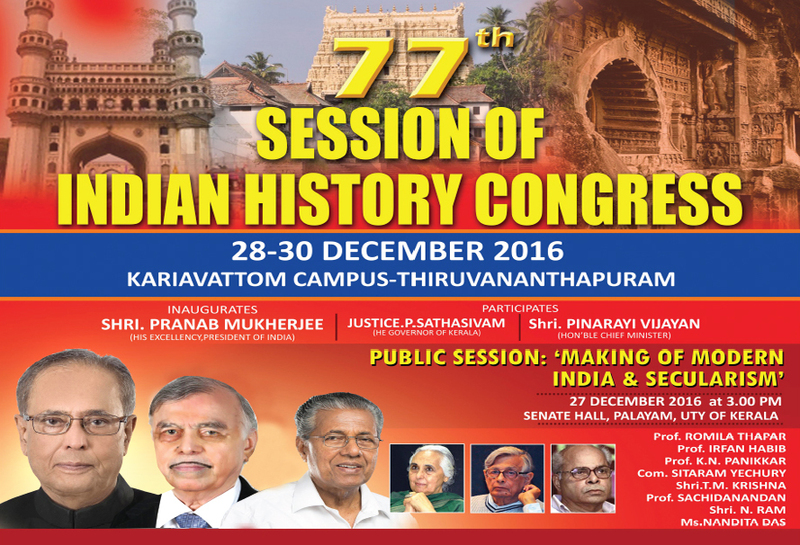 It is a rare honor for the University of Kerala to host the 77th Session of the Indian History Congress after a gap of fifty-eight years. The University is indebted to the IHC for the trust it has reposed on it and profoundly gratified by the immense support extended by the Government of Kerala to consummate this long cherished aspiration. The President of India, His Excellency Shri. Pranab Mukherjee will inaugurate the Congress at the Golden Jubilee auditorium, Kariavattom Campus on 29 December 2016 at 12.30 PM on the invitation of the Hon'ble Chief Minister of Kerala. Around three thousand delegates and erudite scholars from around the country and abroad will be participating in the three day deliberations on various facets of Indian life and History. The Congress will be held on 28, 29 and 30 of December 2016 at the Kariavattom Campus. A Curtain Raiser Public session on the 'Making of Modern India and Secularism' will be held at the Senate Hall, University of Kerala, Palayam, Thiruvanathapuram on 27 December 2016. The session would be inaugurated by the Hon'ble Chief Minister, Shri. Pinarayi Vijayan at 3.00 PM. The Public seminar would be chaired by the internationally reputed historian and Public Intellectual Prof. Romila Thapar. The other invited speakers are Shri. T M Krishna (Ramon Magsaysay Awardee); Shri N Ram(Media Person); Prof. Satchidanandan (Poet and Litterateur); Comrade Sitaram Yechury and Ms. Nandita Das (Film Director and Actor). This is perhaps the first time that the state is witnessing the participation of internationally reputed celebrities, of such professional diversity, sharing their thoughts on a single theme from a single platform in a profoundly harmonizing gesture of universal humanism. Besides the Inaugural Session, there will be eleven Parallel sessions some multiple sessions on Ancient India; Medieval India; Modern India;Countries Other than India; Archaeology; Contemporary India and four panels and a symposium. Most of these Sessions would require two adjacent Seminar Halls due to the large number of Paper presenters. The Seminar Venue would also organise an Exhibition on Kerala's history and Culture. The Kerala State Archives, Department of Archaeology, KCHR, Department of Culture and Tourism etc., will be participating. Book exhibitions will also be held. There will be a Cultural Programme in the evenings showcasing the quintessence of Kerala. The entire Conference will be video/audio recorded. The organizers of the Session, inter-alia, has the responsibility of Transporting, Accommodating and providing Breakfast, Lunch, Dinner and snacks in the morning and evening, besides supportive amenities. Reception Centers and Facilities have to be organized at the Railway Station, Bus Stand and Airport manned by volunteers. Delegates would start arriving by the 27 December, and most would leave only by 31 December 2016. A large number of dignitaries including a dozen former Vice-Chancellors, Padma Award winning historians, Public Intellectuals, Media Personalities, Important political personalities, et al, will be attending the proceedings. The task of holding the conference is daunting and the active support of the State Government, UGC and other Institutions are an indispensable requirement for its success. The University of Kerala is privileged to host the international conference and considers the responsibility bestowed on it as a testimony of its excellence as exemplified by the Chancellor's Best University Award and NAAC 'A' Grade. This panel aims at raising the awareness among Indian historians of the value of Dutch sources for the study of India's past. Still relatively unknown among Indian scholars and hence largely unexplored in this respect, the vast records of the Dutch East India Company (VOC) and related Dutch materials contain a wealth of information on India's political, economic, and cultural history in the 17th and 18th centuries. More extensive research of these sources would therefore greatly contribute to our knowledge of many aspects of Indian history in this period. In the last decade, the accessibility of Dutch sources on India has improved tremendously. First, all archives of the Dutch East India Company (kept in India, the Netherlands, and elsewhere) have been re-inventoried in detail and, when necessary, restored. Second, a series of archival guides—titled Dutch Sources on South Asia, c. 1600-1825 has been published, which describes all Dutch materials worldwide that concern India. Third, large portions of the Dutch records, including the collections in Chennai and The Hague, have been scanned and are presently being put online. Therefore, it is high time that the availability and potential of these sources are made known to a wider audience of scholars, particularly Indian historians. The panel consists of about eight speakers, who discuss different aspects of the Dutch sources - such as accessibility, maps, language issues, and heritage questions - and also explain how these materials contribute to their specific research, which ranges from the Mughal economy and Nayaka court culture to grammars of Indian languages and Malabar society. The availability of power point is rather necessary to illustrate our presentations and explain certain matters. For abstracts of the presentations, see below. In addition, there are one or two chairs and a discussant. Each presentation would last 25 minutes, including 5 minutes for specific questions. The panel ends with a general discussion about what would be necessary to stimulate the use of Dutch sources for historical research in India. Prof. Ruby Maloni will chair the entire panel or at least part of it. Prof. Om Prakash has been asked to act as discussant for the concluding discussion. The Members of the Panel are: 1. Gijs Kruijtzer 2. Anna Pytlowany 3. Lennart Bess 4. Jinna Smit 5. Merve Tosun 6. Alexander Geelan 7. Bram Van Den Hout 8. Ruby Maloni. Besides these other presenters are Anjana Singh; Nikhil Bellarykar; Murari Kumar Jha. Sectional Meetings : 12 noon to 1 pm.